Right…wheres my screwdriver, saw and the spare wood. I want me a few of these. I plan on taking the soil out, and composting it again so it is only out for 1 year. Point taken though – I forget that not everyone has access to almost unlimited compost. Verrrry interesting. I plan to try growing some potatoes in buckets this year, just because we have a lot to grow and only so much garden space. I’m looking forward to seeing how they do. I have to admit, I’m pretty skeptical of the 100# of yield from 1# of seed claim. That’s rather a stretch, I suspect. But hey, if you get even a quarter of that, it would be remarkable. So, you don’t have all four sides on in these pictures. Is that just for illustrative purposes? Do you assemble them all at once, or add on as you fill the tower with soil? For short people, not having to lift the fill any higher than needed might be a good thing! You fill them as the vines grow. So for starters there is just one row of sides (5.5″ of height) meaning that the seed potatoes are covered by about 3″ of soil. In a week or so the vines will sprout and begin to grow leaves. As the vines get about 8″ tall I will add another row of sides and fill back with soil, burying 70% of the stem. That buried stem will then become a root, and the root (former vine) will begin to send out new tubers to grow into potatoes. In typical potato growing you get about 1′ of space between the seed and the soil surface – the growing space for new potatoes. The tower takes the 1′ of space and quadruples it. That 400% increase in tuber growing area combined with the lavish attention that one can give to such a small space (no weeds, perfect soil moisture and fertility) should add up to significant gains. 1:10 is a great harvest in the field, If I can get 1:30 or even 50 I will be ecstatic. I’m guessing your Yukon Gold won’t produce any more than it would in the ground. Supposedly (no experience here, but so I’ve been told) the early potatoes don’t work. They set their potatoes once and won’t set anymore along the stem after that. The late season potatoes are what you want. They will continue to set potatoes up the stem as the stem gets buried. I’m doing a bin that is made out of tree saplings from my woods and chicken wire to hold in the dirt. It is so not over engineered (but free since I’ve had chicken wire sitting around for years). I’m really hoping it isn’t under engineered or it will spill into my paths. It is only two feet high so probably won’t be too horrible if there is a failure. this is awesome, and to solve the rotation issue, make 3 bins, and have potatoes and two other things. Say for instance sweet potatoes and peanuts as the other two items in rotation. But instead of using the upright posts to wall in more soil, use them to support clear plastic so they stay hot and humid. I dont know much about growing either of those two and I’m sure the yield would not be magnified in the same way as the potatoes, but it would allow you to rotate and keep the soil in production so long as it got some kind of ammendments. That indeed work but he never achieve the 1/100 ratio, more likely 1/25 which is already huge. He find out the second year that by allowing some stem to get out of the bin while they grow was giving some how a slightly better yield. and drainage. You say in one of your reply that not everyone have access to unlimited compost …. Well for once I have to disagree with you, we can almost all have access to a lot of compost, right now craigslist is full of free horse manure compost, more more cities have compost leaf free to be pick up and best of all, my father and I were doing that every fall, gather your neighborhood leaf and compost them, it is easy to pick up the one that have already be pile, and for the one that have not been piled, well start your lawn mower and bag those leave by doing so you will even get the process going faster, in a year you’ll have a good usable compost to grow veggie, in two year you’ll have an amazing starting mix almost free of weed …. Thanks everyone! This post set an all time record at 1 Straw for traffic – looks like small scale ag is catching on! Daphne – It will certainly be interesting to see how the different varieties compare. My only concern is that I may not be able to tell a Kennebec from a Carola when they are dirty 😉 Your bin sounds great! packing the chicken wire with leaves, straw or something to block the sun and retain moisture may make it even better. Kory – I am really not to concerned about the rotation. It will only be about 2-3 wheel barrow loads of soil – and I can always throw that amount somewhere -even just as top dressing in the lawn. But, I think I will use most as filler in whatever compost bin is newest, which should also cleanse the blight. Multiple bins would solve it too, but I think I will just use fresh soil each time. Xavier – 1:25 does sound good, but I am pulling for 1:50 – like Daphne said, it will likely have alot to do with varieties. Yukons are not know for yield even in the field. Purple Vikings are a better bet, I’ve pulled several pounds off one hill before in our home gardens. It is also likely that moisture and fertility will come into play, and I am sure there is some skill needed as to when to cover the vines and how much. -Good thoughts on the compost. Our village’s pile is as big as a house! what a great idea! It’s the first year I try to grow potatoes in containers and this idea is fantastic! Rob and Kory – Thanks for the ideas about compost and rotation. 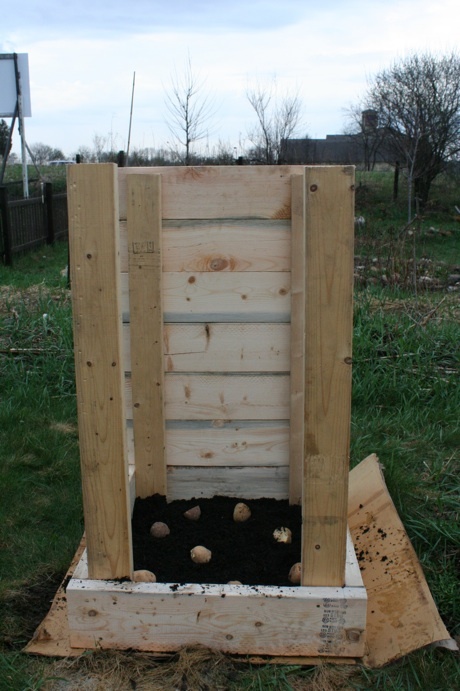 I have more access to manure than compost, and raw manure isn’t good for potatoes – but if I can get compost and rotate it through with other crops (I love the peanuts idea…), that gets a whole lot easier. These are so awesome! 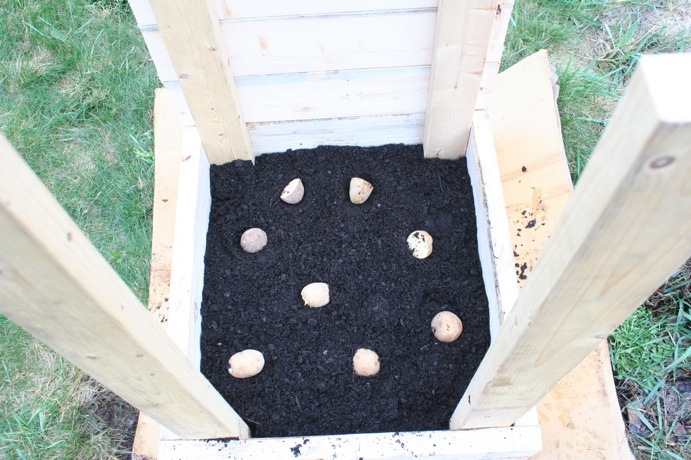 Do you know if you could use straw to build up around the spuds like you can on the ground? I know they can be grown soilless that way but I’m not sure how high up you can pile it and they’ll still grow. It’s just a lot easier for me to come by than extra soil or compost….. Thanks for the inspiration….I’m making at least one of these babies to try out! Interesting post, however, the University of GA, or GA extension has a commercial potato production guide that I came across about 5 years ago. I thought pretty much the same thing you were thinking, so I began mulching my taters in leaf mulch a foot deep. The potatoes will not yield as you think b/c the publication says that although they will send out more roots along the main stem, the actual tips of the stolons that the new potatoes form on will not continue to come out of the stem. They are limited to the area around the stem/seed tuber junction. Rather, there are 4 types of roots that form from the seed spud/stem and the others are more to be “adventitious” so to speak and take up nutrients/water. I also subscribe to “spudman”, a commercial potato industry production magazine that had a similar article years ago discussing these types of roots. The real advantage to deep mulching here in NC (I’m originally from Upstate NY where they grow ALOT of commercial taters) where I live now is to keep the soil cooler and cut down on irrigation and CPB pressure in addition to stealing some early taters. Our soils get so hot here in July when we dig potatoes that they dont like it and sometimes in wet years will actually resprout in the ground if they are in there too long. Good luck with your experiment. We find out biggest yields come from proper greensprouting and well timed irrigation. I have grown potatoes in a ‘barrel’ that is actually a black circular plastic thing, about 36″ high and at least that great diameter, that is sold as a composter. There are some holes cut out on the sides for aerating the compost I guess, and some tomato branches find their way out, but lots of potatoes grow as I keep adding last year’s autumn leaves which do break down over the course of the summer. Since I use leaves instead of soil for the mounds/hills, watering is essential. I am interested that you started on cardboard and compost. I’ve always dug out so the potatoes are on soil, but I think I will give this a trial. 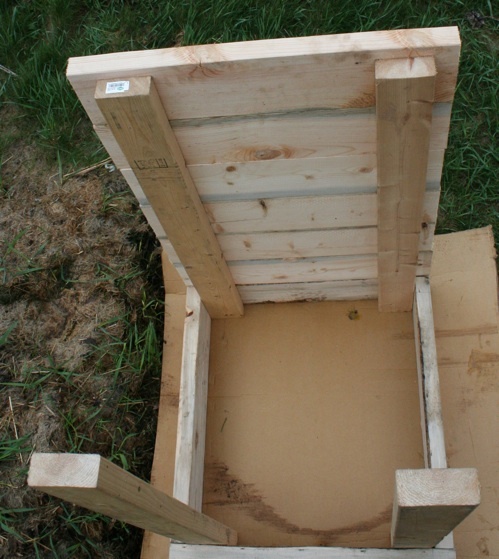 Thanks CW – the carboard is to prevent the my ever present quack grass from also enjoying the mounding technique along with the spuds. Open soil would be preferred, I think. Two plants are up, I love how rewarding growing potatoes can be!